Jay Chevalier, one of the last surviving greats of Louisiana rockabilly, kicked off his musical career at the age of seventeen when he and his cousin landed their own country radio show on Oakdale, Louisiana's KREG. After joining the Marine Corps in 1954, Chevalier formed his first band while stationed in Norfolk, Virginia and by '57 he'd earned the honor of appearing on Jimmy Dean's nationally televised country music show. Inspired by Gene Vincent, whom he'd met and gigged with while in Norfolk, Chevalier cut his first record on Virginia's fittingly-monikered Cajun label that same year, the insanely echo-laden bopper "Rock 'n' Roll Angel." Fascinated by current events, Jay's next record "Big Cloud" was a fascinating hillbilly bopper that commented on the tumultuousness of a changing South during the advent of integration but it was with 1959's "The Ballad Of Marc Elishe" backed with "The Ballad Of Earl K. Long" that the historically-minded Chevalier truly established the topical style that would set him apart from the thousands of aspiring rock 'n' rollers beating on guitars for that elusive hit. Released in the wake of a scandal that found Louisiana Governor "Uncle" Earl Long being committed to a mental institution following his legendary involvement with Bourbon Street stripper Blaze Starr and an "incoherent and irrational public outburst" where he denounced opponents and shouted obscenities, "The Ballad Of Earl K. Long" wasn't the only song written in defense of the Governor. Hollis Albin's ingenious "Uncle Earl Don't Stand Alone" came out on the Hammond label, while Memphis's Sun Studios played host to Ernie Barton's Johnny Cash-esque "The Battle Of Earl K. Long." Chevalier's song, however, was the tribute to the Great Gov that made the most noise, breaking wide open in Baton Rouge, not far from the Capitol building where the whole sordid affair had started. 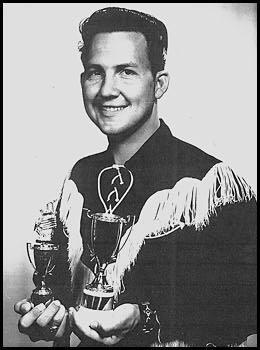 Jay would later meet and work for Long; and from this time onwards his band has always been known as the Louisiana Long Shots in honor of the late, great Uncle Earl. In 1960 Jay was laying down another scorching-yet-topical rock 'n' roll number for Eddie Shuler's Goldband label. Jumping from Louisiana politics to international affairs, the rockabilly licks that bounced off the walls of Shuler's primitive Lake Charles studio housed the lyrics to the utterly classic "Castro Rock." Years later Jay would actually perform the song at Cuba's Hotel Nacional in Havana, capping the evening off in true rock 'n' roll fashion with dinner at the world famous La Bodequita del Medrio restaurant where he signed his name next to Ernest Hemingway's on the wall of fame! Late 1961 found Chevalier embracing his beloved Louisiana in song once again; this time the subject was Heisman trophy winning LSU football star Billy Cannon. Having been in the stands one night in October of '59 when Cannon ran an eight-nine yard touchdown against Ole Miss, Chevalier felt sufficient to comment. "Down in the South where they say you all" he hollered over storming guitar, piano, sax and drums, "There's a man known as Mister Football!" After the death of Long, Chevalier headed west for a stint at Las Vegas's Golden Nugget and cut a session for Hollywood's Crest label. By 1963, he'd called the rest of the Long Shots out to Vegas, and an album was released on Memphis's Cotton Town Jubilee label, featuring a couple of stone Chevalier classics, including "Come Back To Louisiana" and a classic ode to the suds entitled "Watching The Bubbles." As late as 1995, Chevalier was still penning topical songs, recording the excellent "Ballad Of Sheriff Harry Lee" which featured the traditional, twanging sounds of the Long Shots, a sound prominently featured on his latest disc Lost In Louisiana 1959, which mixes material from all stages of his career. A book about his time spent in the company of Long is about to hit the racks, while the German Hydra label is planning a long overdue anthology of all his early sides.